David Lander and Penelope Ann, previously owners of the iconoclastic Edinburgh Gallery Bed and Breakfast, welcome you to Cleburne, their authentic Colonial Homestead, listed by both Heritage Council and National Trust. The four sandstone buildings still cluster round a tree-sheltered courtyard as they did when they were built in the 1820s. We offer luxury Bed and Breakfast accommodation with bold, original, modern art hanging in every room and a delicious breakfast in the Cleburne family's beautiful ballroom. 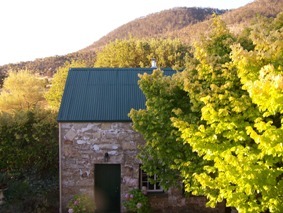 This historic four-acre property - a unique mix of Heritage architecture with striking new art - looks over the River Derwent, fifteen minutes from Hobart GPO, Salamanca and five minutes from Moorilla and the Museum of Old and New Art. 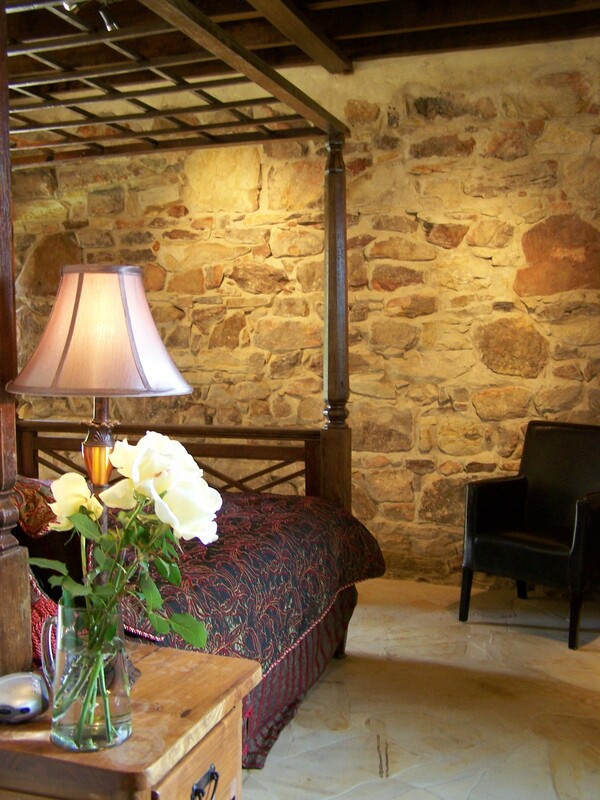 The raw stone walls, sandstone floor and exposed beams of this 1830's barn are contrasted with a King size four poster bed, sumptuous linen, leather chairs, flat screen TV/DVD, sparkling ensuite bathroom and a kitchenette with microwave. This suite is disabled accessible. A trundle bed can accommodate a third person. 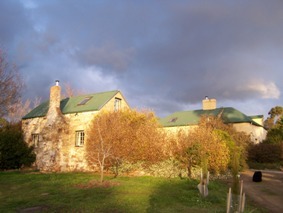 The Cottage is a self-contained building with massive sandstone walls and deep-set windows that look into the courtyard, the Homestead and the willow-shrouded pond. Modern art from our collection hangs on the walls. 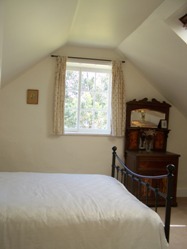 Upstairs - the bedroom has views over the grounds to the Bowen Bridge and Mount Direction. The Queen bed has an electric blanket. 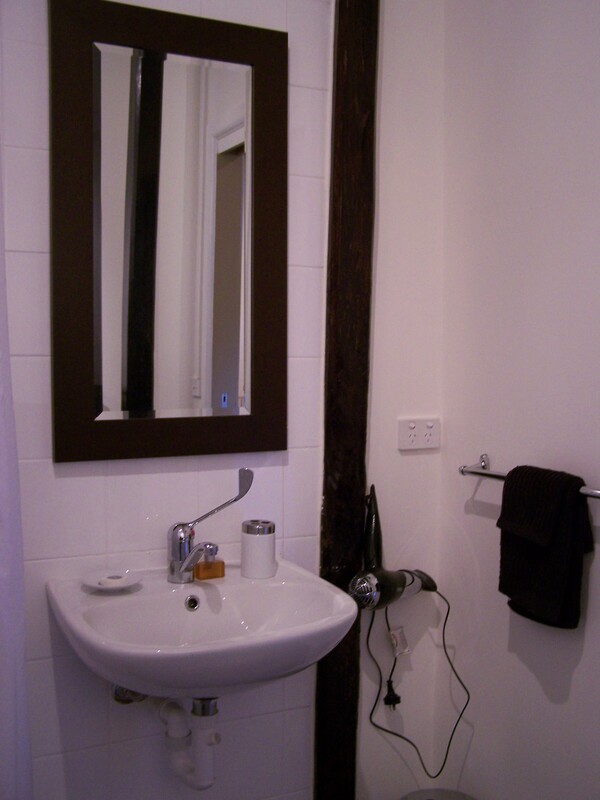 The bathroom has a shower, hair-dryer and heater. Downstairs - the lounge has a slow-combustion heater, armchairs, TV and DVD player and a dining area.Two day beds accommodate two children (a trundle for a third child).The kitchen is fully equipped. 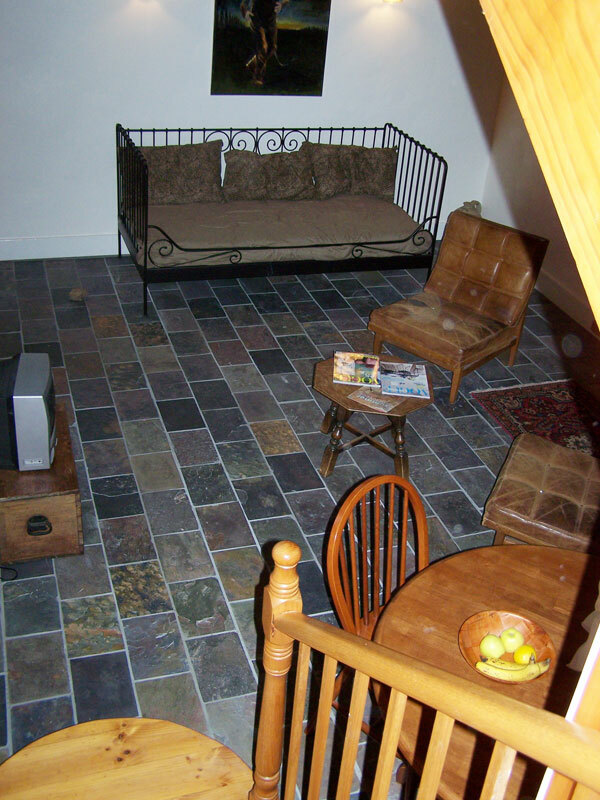 Downstairs - the lounge has a low-combustion heater, a day bed, armchairs, TV and DVD player and a dining area. The kitchen is fully equipped. 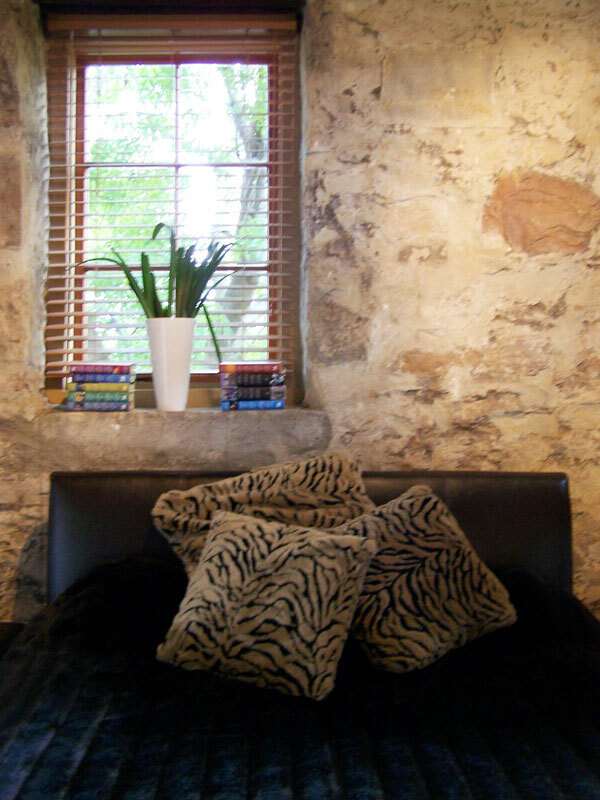 Raw stone walls, sandstone floor,exposed beams and the original feed bins are contrasted with a leather queen bed, sumptous linen, sparkling new ensuite bathroom and kitchenette with microwave and TV,DVD. 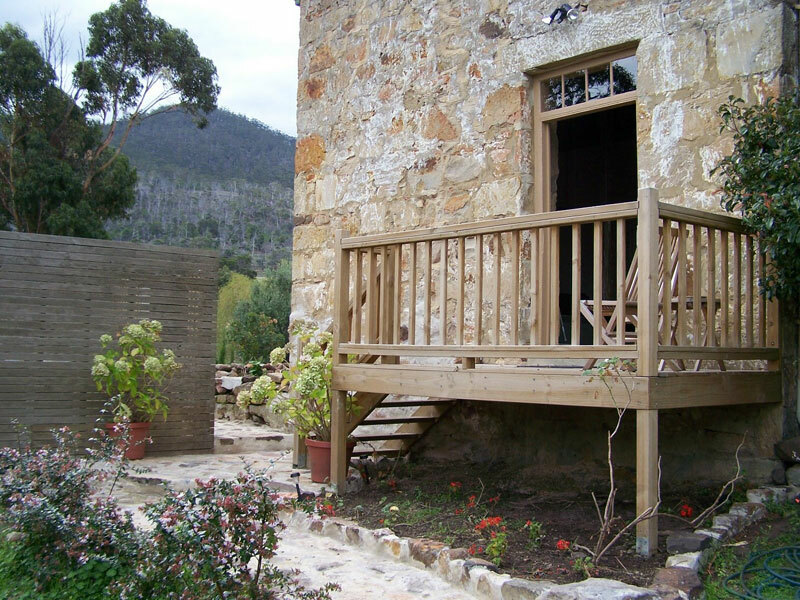 The Homestead Suite is in the main farmhouse with a private entrance off the verandah. We believe it was Richard and Margaret Cleburne's own bedroom. It has been redecorated in muted contemporary colours and furnishings and has internal access through the original hallway to the Reading Room and the Dining Room. Adjacent is the cellar where Cleburne may have stored his contraband. The Homestead Suite has a Queen bed with an electric blanket. 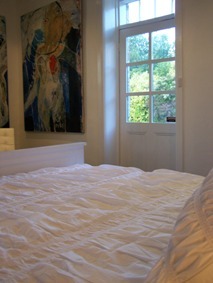 It is also furnished with armchairs, TV and DVD player, refrigerator and tea/coffee making facilities. Artwork is 'Laudanum' by John Lendis, from his remarkable series of oil paintings about Jane Franklin. Down two steps is the dining room with tea/coffee making facilities, sink, refrigerator and a microwave for heating food. Artwork is by Melbourne artist Irene Barberis. 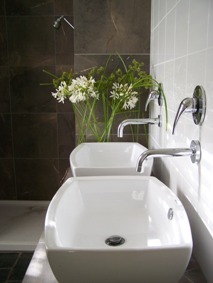 The bathroom is stunning - starkly simple - with pure white stone walls and dark slate floor. It has a free-standing bath, separate shower and hair-dryer. Please note some doors are lower than usual. Lowest is 1810 mm/5'11".